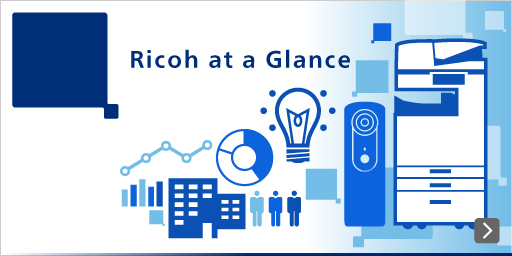 The RICOH Pro VC60000, a high-speed continuous feed inkjet (IJ) printing system, prints high-quality images at high speed on offset coated paper, which does not absorb aquatic inks well. Conventional continuous feed IJ printers were not capable of printing on such paper. The RICOH Pro VC60000 consists of four functional units: undercoating, printing, protector coating, and drying. Undercoating unit: Applies an undercoating agent to prevent ink unevenness and abrasion. Printing unit: Forms images by discharging quick-drying pigment inks onto the paper. Protector coating unit: Applies protector coating agent to protect the printed surface. Drying unit: Dries and fuses the supplies including the inks by way of a heater. The description below refers to the dynamic print head positioning technology in the printing unit. A continuous form can sometimes meander depending on the operating environment. A meandering form causes the four print heads – black (K), cyan (C), magenta (M), and yellow (Y) – to be misaligned with each other relative to the form. Thus, the ink droplets discharged from the print heads are also misaligned (plate misalignment). Form meandering and misalignment are generally compensated for by a form controller, which is installed at the form inlet of the printing unit to adjust the form position. The compensation by the form controller is sometimes insufficient, resulting in low print image quality. *2 In double-sided printing, registration is performed to align the print positions on the front and back sides. The automatic print head position adjustment unit has a form edge sensor for each of the K, C, M, and Y print heads. An actuator is installed for each of the C, M, and Y print heads to control their micro movements. With reference to the K position, the sensors detect the form position misalignment during the CMY printing step. The detected misalignment is used to calculate the amount of form meandering. The actuators control the head positions according to the long-cycle form meandering. 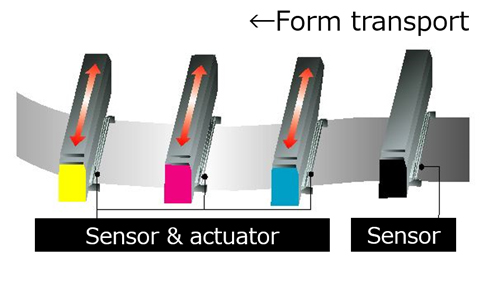 The actuators control the head positions at an accuracy of 5μm or less. The technology boasts a color-to-color registration accuracy of 35μm or less on general offset paper whose meandering is in the order of tens to hundreds of micrometers. 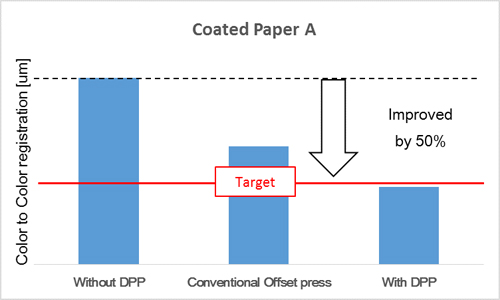 Inkjet printing has attained an accuracy comparable to, or even greater than, offset printing. This technology has been developed for high-speed inkjet printing systems and is based on the precision driving technology Ricoh has developed for electrophotography. Technology categories: Field – "Printing" | Product – "Production printer"